We offer piano lessons for Glen Ellyn, Wheaton, and beyond. We offer piano lessons for Glen Ellyn, Wheaton, and beyond. Our approach to piano instruction is unique in that we want our students not just sight reading and learning the classics but also improvising and composing. We call this our “two-lung” approach: we want our students “breathing with both musical lungs,” playing by sight and by ear. Though all of our students actively engage with and assimilate the classics, we also seek to help them to be well-rounded, like being able to write music of their own or play their favorite popular song by ear, without sheet music in front of them. We believe this will ensure a life-long relationship with the instrument. In any one of our bi-annual recitals, you are bound to hear anything from Bach to Brubeck to Beck, and many of our piano recitals feature an original student composition. A number of our students have participated in (and excelled) in Illinois’ Achievement in Music program (through our local ISMTA chapter). We have a faculty of seven professional, Conservatory-trained piano instructors who are all active musicians, performing around Chicagoland, serving in their churches, and here at Bellas Artes committed to sharing that joy with their students. 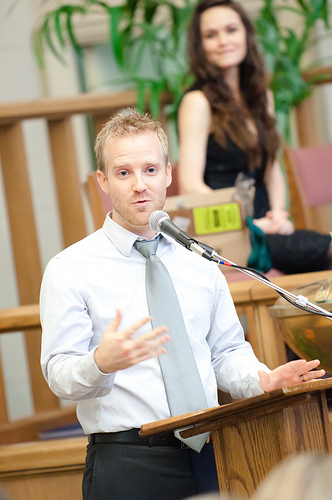 Justin Jacobson (Wheaton College, ‘03, ‘08) earned his Music Composition degree at the Wheaton Conservatory of Music, where he studied piano with William Phemister and composition with Howard Whitaker and John Lane. Justin is an active church musician, songwriter, composer, recording artist, recording engineer, music instructor, and active member of the Music Teachers National Association. He is happily married to Victoria, one of the violin instructors here at Bellas Artes, and is now the proud father of four beautiful girls. He grew up in Argentina, where he first began his study of classical piano, along with tango and Argentine folk music. He has been teaching for over 10 years now and absolutely loves interacting with his students, seeing them progress and achieve things they never could have imagined themselves achieving before. His aim is not so much to turn his students into virtuosos but to cultivate in them a love for music that will last a lifetime. Therefore, Justin’s desire is to bring musical education into a more holistic equilibrium by complementing the traditional paradigm of instruction. He requires all of his students to learn how to read music and to do so proficiently, but he also encourages and teaches them how to improvise, how to compose their own music, and how to play “by ear,” reproducing their favorite song on their iPod in a piano reduction. It is for this reason that a number of his students have played original compositions in their recitals, and one of his young students recently received awards all the way through the Illinois state level for his original composition. This paradigm of instruction does not take place to the neglect of the classics; on the contrary, it seeks to build upon their foundation. Paul Danielson (B.M. in Composition, Wheaton College, ’12) studied composition with Dr. Howard Whitaker and Dr. David M. Gordon, and piano with John Zimmerman. Paul has had his music performed and recorded by many ensembles at Wheaton, including the Men’s Glee Club, the Women’s Chorale, and the Symphonic Band. While in college, Paul served as the Honors Conductor and Vice President of the Men’s Glee Club under Dr. Mary Hopper. Paul began playing piano when he was eight years old, but never played anything but the sheet music that was assigned in his lessons. Because he didn’t always relate to the music, he had a difficult time expressing himself with it, and often had trouble being motivated to practice. This all changed when he successfully tried to play one of his favorite songs by ear, and a new world of music “off the page” opened up. Paul explored this new world by starting a band with some friends, writing some of his own songs, and composing for films. In addition to all this, Paul found that his new relationship to music helped him find vitality in the same sheet music that used to seem dull. Because of this background, Paul seeks to teach students not only how to read and perform music on paper (which is vital), but also how to improvise, play by ear, write their own music, and develop a spirit of musical exploration and expression. Originally from Seattle, WA, Matt Peterson is a jazz and classical pianist and composer. He has composed for film, theatre, and Internet productions, and has performed as a soloist and in a variety of groups around the country. Matt holds a Bachelor’s in Piano Performance and Composition from Wheaton College, where studied with Daniel Horn and Howard Whitaker. He also holds a Master’s in Jazz Studies from the Jacobs School of Music at Indiana University. In 2010, he was invited as the overall winner of the Ben Heppner Concerto Competition to perform Gershwin’s Concerto in F with the Wheaton College Symphony Orchestra. In the summer of 2013, he worked as a pianist and percussionist with the Disneyland All-American College Band at the Disneyland Resort in Anaheim, CA. He was an invited performer at the 2013 Monterey Next Generation Jazz Festival with the Indiana University Quartet. Matt has studied jazz under Luke Gillespie, Nicole Mitchell, Bradley Williams, Steve Houghton, and David Baker and has had the privilege of sharing the stage with Curtis Fuller, Peter Erskine, Gordon Goodwin, Gregg Field, and Wycliffe Gordon. Matt performs in a number of jazz groups around the Chicago area. He is passionate about music education and believes in the art of simultaneously encouraging students’ self-confidence and self-worth and challenging them enough to stretch their abilities and broaden their horizons. Christiana Ostoich (M.M. in Music Theory & Cognition, Northwestern University, ’14) began studying piano at the age of four and flute at nine, in addition to singing in classical children’s choirs. Although her training began classically, Christiana quickly developed an expansive musical appetite and continues to explore new styles and approaches. Most recently, Christiana studied music cognition with Dr. Richard Ashley and and popular music at Northwestern University, with her thesis focusing on perception and replication of syncopated rhythms found in contemporary popular music. Before Northwestern, Christiana taught elementary music in Aurora, IL, developing deep appreciation for the Orff Approach, which incorporates speech, singing, instruments, and movement to foster students’ creativity, organically teaching improvisation and and composition from day one. At Wheaton College (B.M.E. in Music Education, ’12), Christiana studied flute with Dr. Jennie Brown and performed with the Symphony Orchestra, Symphonic Band, and Flute Quartet (Winner, 2011 Chamber Competition). Christiana also studied conducting with Dr. Daniel Sommerville and Dr. Paul Wiens. This comprehensive background fuels Christiana’s philosophy of developing thoughtful and creative musicians, not merely technically proficient flute or piano players. By developing technical skills and learning historically excellent repertoire, students gather the tools to become expressive artists. Christiana strives to help students not only build these resources but also put them to use in ways that provide both personal fulfillment and opportunities to enrich the lives of others. Christiana also works at Church of the Resurrection in Wheaton, IL as the Production Manager, supervising all teams and logistics for weekly and special services in addition to assisting with Resurrection’s choirs and leading worship in various settings. Julia is passionate about encouraging and teaching children to become life-long lovers and creators of music through classical training and improvisation at the piano keyboard. This includes exploring music theory, various genres and all periods of classical music to create a well-rounded musician. Included in this is good technique, disciplined practice habits, and musical expression in every piece learned. She desires to support her students in their musical interests and enable them to continue to expand as they grow. In her spare time Julia loves long walks with her fiancé, cooking tasty food and baking delicious treats. Good conversation with dear friends or reading a book in the sunshine is her favorite way to spend a lazy afternoon. She also loves swing dancing to Frank Sinatra or driving on a windy road with the windows down, singing along with the radio. Heather Messer has been playing the piano since she was six years old. In middle school, she began competing in several competitions and programs including the Washington State Music Teacher Association, Seattle Young Artists Music Festival, and Young Artist Master Series. Besides piano, Heather’s second musical love is choir. She grew up singing in church choirs, which eventually led to leading her church youth choir. She has also sung in the Rainier Youth Choir, Green River Community College Jazz Voices, and accompanied the Green River Community College concert choir. Heather graduated from the Wheaton College Conservatory of Music in 2016 with degrees in Piano Performance and Piano Pedagogy. Through studying piano with Dr. Karin Edwards at Wheaton College, and Dianne Nichols in pre-college years, Heather has grown a deeper appreciation for music as well as excellent teaching. Heather enjoys using her piano talents to collaborate with other musicians, especially vocalists, and has enjoyed accompanying solo singers and choral ensembles. She has accompanied both the Women’s Chorale and the Men’s Glee Club, as well as sung in and served as the Honor’s Conductor in the Women’s Chorale under the direction of Dr. Mary Hopper. In her teaching, Heather seeks to help her students discover the joy in learning. She tailors her teaching to each of her student’s needs in order to help them reach their greatest potential. She aims to inspire excellence in learning and a love for the beauty of music. Besides music, Heather enjoys a variety of activities including being in the outdoors, hiking in the mountains in her home state of Washington, water skiing, playing Ultimate Frisbee, drinking coffee, and playing with kids. Jaella Lowe is a classically trained guitarist. She holds a Bachelor of Music in Classical Guitar Performance from the Moody Bible Institute in downtown Chicago and has been teaching for several years now. Jaella’s musical career began at the age of eight. At age eleven, she began playing on the worship team at her church, where her father was the music director. In addition to music, Jaella also loves spending time with her husband Chad, hanging out with the students in her small group at church, drinking tea, drawing, and anything outdoors. Devin Starr is a professional clarinetist and collaborative pianist who currently works in the Chicagoland area. He received his Doctor of Musical Arts degree in May 2016 from the University of Oklahoma where he studied with Dr. Suzanne Tirk and taught as an adjunct professor at the same institution. During his four years in Oklahoma, Dr. Starr also served as the woodwind department accompanist and opera accompanist at OU while simultaneously teaching clarinet and serving as a maternity leave replacement. He received his Bachelor’s Degree in Music Performance from Grand Valley State University where he studied with Dr. Arthur Campbell and his Master’s Degree in Music Performance from Bowling Green State University where he studied with Mr. Kevin Schempf. Starr has competed in several competitions, most recently as a finalist in the 2015 NAFTZGER Young Artist Competition. He has performed several solos with the Wheaton Municipal Band and played principal with the West Wind Chamber Players of Oklahoma City. Starr was also a Finalist at OU’s 2013/14 Concerto Competitions and BGSU’s Chamber Music Competition. He has presented masterclasses and sectionals at the University of Central Oklahoma, University of Oklahoma, Tulsa Youth Orchestra, and several high schools. Alongside performing on clarinet, he has spent much time on the piano, solo and collaborative. Most recently, Starr premiered Kenn McSperitt’s triple concerto for Saxophone, Piano, and Strings in 2015. He was on staff with OU as the opera accompanist, performed piano with the orchestra on Stravinsky’s Symphony in Three Movements, and toured around accompanying for John Davies’ “Three Little Pigs” opera (based off several Mozart operas). Starr has also performed for many venues including solo recitals at BGSU and UofM with the Principal Clarinetist of the Hong Kong Philharmonic, recitals with the Principal Bassoonist of the Oklahoma City Philharmonic, and dozens of other student recitals, chamber ensembles, orchestras, bands, and new music ensembles. Starr has also worked with dance, combining clarinet playing and modern dance in hopes of expanding the boundaries of standard performance to add a more visual aspect. He has travelled throughout the United States, Germany, and France playing with orchestras, bands, new music ensembles and chamber ensembles, as well as going to help teach young musicians in youth orchestras, middle schools, and high schools in the Midwest and Texas. Some of the musical ensembles he has worked with have included the Blue Lake Symphony Orchestra, Toledo Symphony Orchestra, Wheaton Municipal Band, and GVSU New Music Ensemble. When not working in the music industry, Starr is a huge fan of the outdoors and is perfectly content to be out in the middle of nowhere with a bonfire and a tent. He likes spending time away from technology and loves, despites his profession and extroversion, peace and quiet. Aside from classical music, Starr loves movie soundtracks. Rachel Cirvencic began taking piano and violin lessons at the age of 5. Homeschooled and growing up in Cleveland, Ohio, she studied piano with Gerardo Teissonnière in the Preparatory Department and studied violin in the Sato Center for Suzuki Studies at the Cleveland Institute of Music. She was a member of the Contemporary Youth Orchestra throughout her high school career as a violinist and during her junior year, she began taking viola lessons with Lisa Boyko of the Cleveland Orchestra and joined the Cleveland Orchestra Youth Orchestra for her senior year. Rachel also thoroughly enjoys chamber music as a pianist and attended the Credo Chamber Music Festival in Oberlin, Ohio, for the summer sessions of '11, '12, '13, and '15. She graduated from Wheaton College in May, 2016 with a B.M. in piano performance. Rachel absolutely loves playing music with others and is passionate about accompanying vocalists, instrumentalists, and choirs, collaborating with other musicians, and sharing the joy of music with others. She also enjoys working with children of all ages through mentoring and teaching music. Rachel firmly believes in cultivating relationships with children and teens that are encouraging and mature. She achieves this through meaningful conversations and sharing the beauty of music. Along with music, Rachel loves exploring the outdoors, baking, going on adventures with her fiancé, drinking coffee, writing letters, exercising, and musical theatre. Rebecca Peterson is a music educator and oboist currently living in the greater Chicago area. She holds a Bachelor of Music Education degree from the Wheaton College Conservatory of Music. In addition to teaching privately, coaching chamber music groups, and directing ensembles in a classroom setting, she is an active oboist, having performed as a soloist and in chamber groups and orchestras. As an educator/performer, Rebecca enjoys a wide diversity in her experience. As a member of the Binger Sextet, Rebecca was awarded first place in the 2010 Wheaton College Chamber Competition. In the same year, she was invited to perform on stage at Orchestra Hall at Chicago Symphony Center with the Wheaton College Symphony Orchestra. In the summer of 2011, Rebecca worked as the director of a 30-piece choir of Chinese high school students at the Pui Tak Community Center in Chicago, IL. At Pui Tak, she pioneered and implemented her own vocal curriculum, spearheaded publicity, coordinated and directed rehearsals, and organized an end- of-summer concert. Rebecca has also worked as an Instrumental Music Instructor and directed elementary school band in the Geneva School District. Rebecca worked as the Arts Director at the Boys and Girls Club of Ellettsville, Indiana, where she launched the development of a music program and organized and booked musicians for the club’s first ever Guest Artist Series. Her love for youth education also took her to the Vysoke Myto English Camp in the Czech Republic, where she taught English and music to teenage students for three summers. Rebecca has worked in the Los Angeles area as the Woodwind Specialist at St. John Bosco High School. She also worked to incorporate music into the curriculum of Life Covenant Church’s children’s ministry program in Torrance. She currently teaches privately and serves as the Music Director at Wheatland Salem Christian Academy in Naperville, where she has worked since 2016. Rebecca aspires to use her talents in music education, music therapy, and the Alexander Technique to benefit young musicians. With over 20 years of experience as a music educator, Marjerie Lucas has a proven background of motivating students to reach their hightest potential in piano. She completed her doctoral degree in Special Education in May, 2015 from Indiana University, with emphases in Brain Science, Neurology, Music, and Autism. She studied with internationally known piano pedagogue Dr. Maurice Hinson and finished her masters and undergraduate degrees in Piano Pedagogy at Butler University. For the past ten years, she has served as an Advisor To The Faculty for the Young Pianist Program at Jacobs School of Music, Indiana University. She also served as a Program Developer/Piano Instructor at Butler University, where she advised the piano faculty for the Butler Community Arts School and lectured for the piano pedagogy classes at the School of Music. She also laid the plans for an upcoming piano camp (summer 2019) for children with developmental disorders. For over twenty years, her methods have been tailored toward the individual learning style and personality of every child. In large part due to her unique specialization for children with special needs, she has seen great success with students of all ages and abilities, with a student recently debuting at Carnegie Hall. Regarding children with disabilities (especially those with autism), she believes that music instruction through piano can be highly successful in developing neural circuits for cognitive processing. Toward this end, she developed a method of music instruction based on the natural harmonic progressions of scale degrees. She is coauthoring a book on the brain and music through piano with brain scientist, Dr. Xioaming JIn, at the Indiana University School of Medicine in Indianapolis, IN. Sara Beth Thomas is a deep lover of music and wishes to share this love with those who cross her path. From her earliest years, she developed a passion for piano that was unparalleled with any other pastime and by age eight, she was composing, improvising and reading music. Raised in a home where music is valued as a precious gift, Sara Beth treasures every memory of singing and dancing around the kitchen with her sisters, or playing Christmas carols before bedtime for her family during the advent season. These are the memories which have given her her deep rooted love of music. Uniquely shaped by her upbringing in Guadalajara, Mexico, Sara Beth is quite relationally oriented and finds herself able to relate easily to people of varying cultures and backgrounds. She grew up as the daughter of two church planting parents, so by age ten, her gifts were already being used in the church as she helped lead worship each Sunday for a small congregation just outside the city. She has a particular passion for jazz and improvisation and is currently in the process of earning her music degree in Piano Pedagogy with a focus in Jazz studies at Wheaton College under the instruction of Brad Williams. She continues to broaden her classical repertoire by taking additional classical lessons with Dr Karin Edwards, and seeks to incorporate a balance in her own teaching style between reading classical music and improvising. While maintaining a structured direction to her lessons, Sara Beth also desires to make music learning fun and accessible. Her highest priority is to instill a lifelong love of music in all of her students. Joshua Uhe is a classical pianist with more than fifteen years of experience at the piano, both as a collaborative and solo pianist. Having grown up in Grant, MI, where he studied under Karen Cook, he went on pursue Music in college, both at Grand Valley State University and Moody Bible Institute in Chicago. At Moody, he studied piano under Dr. Un-Young Whang, where he gained experience as a piano teacher and student accompanist. He also served as a member, accompanist, and vice-president of the Moody Men’s Collegiate Choir, with which he toured the USA, Southern Africa, China, Mongolia, and Japan. He currently accompanies and sings with The Archmen, a men’s vocal octet, that he and his friend co-founded. Joshua is passionate about piano pedagogy. His pedagogical role model is Nadia Boulanger, an extraordinary composition teacher, many of whose students became exceptional composers and musicians under her tutelage. In agreement with her teaching philosophy, Joshua believes that the place to start with each student is his or her natural strength. A student can become good at any skill through faithful, thorough, intelligent practice. But a student can become exceptionally great at something in which he or she is naturally gifted. It is Joshua’s philosophy to immediately begin with his students’ strengths so that they can develop what makes them unique as artists, as well as to aid them in diligently improving their other skills. Joshua believes that forming daily practices and habits will have the most significant long-term impact on the growth of a student as a pianist, a musician, and a person. He also believes that the best musical education is a comprehensive one. For pianists, this includes performance repertoire, ear training, technique, theory, sight-reading, improvisation, composition, and transposition. Away from the piano, Joshua enjoys going for walks or runs in nature late at night, reading, playing a good game of chess, cribbage, or euchre, and watching flop movies with friends.